NetCrawl does not differ from other adware programs because it is also going to show various in-text, interstitial, search-related, and other kinds of commercial advertisements on your screen. These ads might seem decent at first sight; however, the truth is that they might even lead you to malicious software. As NetCrawl is compatible with all the major browsers, including Internet Explorer, Google Chrome, and Mozilla Firefox, you will not be able to avoid those ads if your system is infected with adware. The only reliable way to stop them from appearing is to remove NetCrawl entirely from the system. There are two main methods to do that; however, we recommend that you use the instructions provided below the article in order to erase this program manually. Even though NetCrawl is not a very serious infection, the research implemented by the specialists of pcthreat.com has shown that you might infect your system with serious malware if you let NetCrawl stay on your system. If you think that the possibility to infect the system with malware is very low, we have to upset you because the truth is that you might infect your system with threats by just clicking on a single advertisement. As you can see, adware is not completely decent software, which is why we recommend that you erase it from the system as soon as possible. You should definitely not expect that NetCrawl will enhance your browsing experience and even help you save money on various commercial websites, including ebay.com, amazon.com, and the like because its purpose is entirely different. In order not to allow various useless applications enter the system in the future, you should keep your antimalware tool enabled all the time. It will definitely not allow various suspicious programs enter your system in the future, which means that it is worth investing in it. You should never keep unreliable applications on the system because they might perform various suspicious activities, attract much more serious threats, and not allow you browse the web without any interruptions. The easiest way to get rid of this advertising-supported application is to scan the system with a licensed tool. 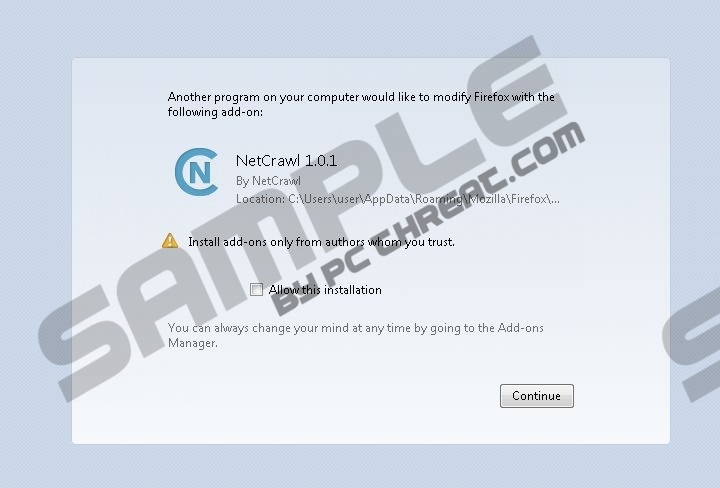 However, you will be able to remove NetCrawl if you follow our manual removal instructions as well. Do not forget to scan the system with a diagnostic scanner in order to check whether there are no other infections hiding on your PC. We recommend using a free SpyHunter scanner; just click on the Download button below the article and an automatic download will start. Start typing Control Panel. Select it. Locate the unreliable software. Select it. Open the Start menu and then select Control Panel. Find the software that you wish to erase. Click the Remove button to eliminate it. Quick & tested solution for NetCrawl removal.